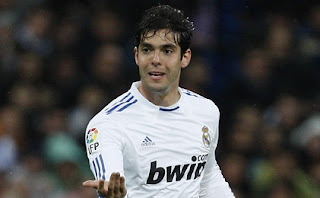 Kaka will be offered to Chelsea after Jose Mourinho decided he is ready to dump him from Real Madrid. The Brazilian, 29, appears to be finished at Real after unimpressive displays during pre-season. He will meet Mourinho and club president Florentino Perez this week, and he will be made available for around £25million. Since arriving at the Bernabeu from AC Milan, Kaka has struggled for form and with injuries – he fears the Premier League would kill his career if he flops again. He cost Real a whopping £60m in 2009 and might prefer a return to Italy. Kaka's father has suggested the Real Madrid star may be set for a return to AC Milan. Rumours have persisted that he could depart the Bernabeu and while Chelsea have now been linked, a return to Milan appears more likely should he allowed to leave the Spanish giants.